Time to dust off a game worth playing! Dust: An Elysian Tale is a Metroidvania-style action-RPG that once again, is coming to the latest hit console, the Nintendo Switch. I tried Dust out once before a couple of years ago, after downloading it for free on PlayStation Plus – however, I never got around to playing it, and thus it was left collecting ‘dust’ (pun intended) in my massive PS4 library. Thus, the Switch release of Dust: An Elysian Tale allowed me to finally experience the game I had once brushed off in a new light, and in a market full of Metroidvania-style games, the six-year-old Dust, really held up as one of its own, visually and mechanically. The story of Dust: An Elysian Tale is quite a simple one on the surface, you play as Dust as he begins waking up from a sleep, when you come across what seems to be a sentient, talking sword. Shortly after meeting the sword, a flying squirrel, fairy-type creature named Fidget flies over, looking for the sword. It is here that Dust realises that he has forgotten everything he knows, and that along with the sword and Fidget, sets off on an adventure to find his forgotten memories, to truly find out his purpose and past. While the story at first sounds very basic, and in the same vein as a fairy tale, there are many discoveries that you make along with the deep, interesting and likable characters that kept me coming back and overall kept me wanting to know more about Dust and his past. 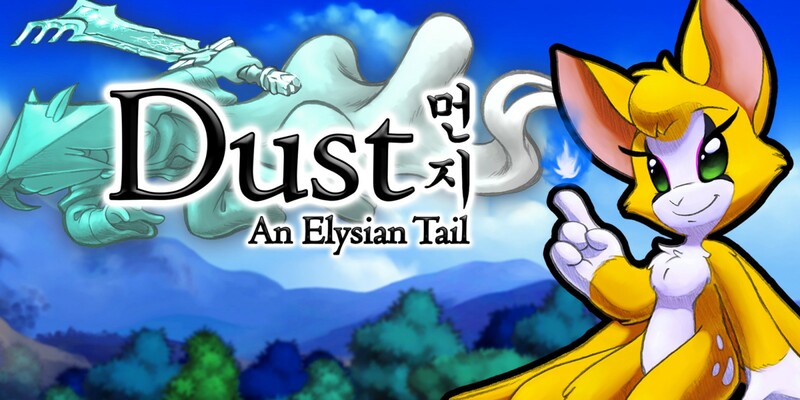 Dust: An Elysian Tale’s gameplay is fun, smooth and satisfying. The ‘levels’ are set out in a very similar fashion to those of Metroidvania style games. There is a large map that Dust can traverse, however, many different exits and paths are limited by obstacles and doors that require abilities and items acquired later into the games. In the levels, you’ll come across many enemies and NPCs along the way. Combat in Dust is extremely satisfying, using Ahrah, the sentient sword you meet at the beginning of your adventure, you’ll be able to use a multitude of attacks to plough through enemies quickly. You can also use Fidget to attack, she’ll shoot projectiles and using specific moves, you can manipulate these projectiles. Later in the game, different projectiles will be unlocked, which can cause different effects to enemies and are helpful in different situations. At the end of each main mission, there is a boss fight. While these boss fights (and combat) in general aren’t that difficult, they’re well designed and kept me wanting more. After defeating enemies or completing a mission you’ll gain XP, which will allow Dust to level up. Once levelled up, you’ll be able to invest a skill point into whichever area you deem necessary, whether you want to upgrade health, attack or Fidget’s projectiles, having this personalisation allowed me to play the game in my preferred playstyle, and overall, adds a lot more depth into repeated playthroughs. There are many ‘mini-games’ within the game as well, which come in the form of time trials. You’ll be thrown into a dungeon of sorts, where your goal is to defeat all the enemies and traverse the rooms as fast as possible. It’s fun to go back and apply prior learning to these trials and to try to make it the top of the leaderboards. The visuals of Dust: An Elysian Tale, are phenomenal. The world, characters and animations are vibrant, smooth and hands down the best in any indie game. This game is a treat to the eyes and the character design are some of the best in any game I’ve played recently. All of the sprites and backgrounds are traditionally animated and this effort definitely shows. Along with the spectacular visuals, Dust also sports a full voice-acted cast, which deeply compliments the well-written story and overall makes Dust’s world more impactful and believable. While the combat can sometimes be a bit repetitive and easy, playing Dust: An Elysian Tale really is a treat. The game is satisfying to experience, both in terms of combat and exploration and after putting the game down, I found it hard to not go back to it. Along with the visuals and extremely inviting and interesting story, Dust: An Elysian Tale is a game I find hard not to recommend and is by far one of the most interesting Metroidvania games I have ever played. It’s worth the money to buy, especially with the amount of content included in the game.